Marshall Stuart Straight came from a well-established Chelmsford family. He was educated at the town’s Grammar School and Haileybury. In 1911 he went to Canada where he worked as a land agent. Following the outbreak of the war he joined the Canadian army and came to England after which he gained an officer’s commission. He married in August 1915 and soon afterwards went to Gallipoli. He was killed in action there on Christmas Eve 1915 by a bomb dropped by a Turkish aircraft. His family’s home was in Maltese Road. The bride, who was given away by Mr. A. C. Durrant, uncle of the bridegroom, the Misses Marion E. and Brenda M. Straight. as bridesmaids. The bridegroom wore uniform, as did his brothers, Sub-Lieut. A. H. Straight, R.N.R., who acted as best man, and Second-Lieut. R. M. Straight, 2nd Essex; while Capt. P. M. Anderson, of the Headquarters Staff of the Canadian Contingent at Shorncliffe, was also present. Marshall subsequently served as a temporary 2nd Lieutenant in the 12th Battalion attached to the 1st Battalion of the Essex Regiment and landed in Gallipoli in 1915. Marshall was killed in action at W Beach, Helles in Gallipoli on Christmas Eve 1915 by a bomb dropped from a Turkish aircraft. He was aged 26. He is buried at Lancashire Landing Cemetery, Gallipoli, Turkey (grave: L. 18). “As we are at tea, four enemy machines sweep over “W” Beach, and shortly after I hear the sound of dropping bombs as they circle round and round. Our anti-aircraft guns (not plentiful) endeavour to bring them down, but they circle round unconcerned, and having discharged about thirty bombs, swing round and make for their back lines, keeping out to sea off the coast. “LIEUT. M.S. 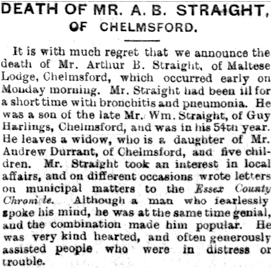 STRAIGHT KILLED News reached Chelmsford this week that Sec.-Lieut. Marshall Stuart Straight, 12th Essex Regiment, attached to the 1st Essex, was killed in action on Christmas Eve. Deceased, smart young officer, was the eldest son of the late Mr. Arthur B. Straight, of Chelmsford, and Mrs. Straight, of Woodbury, Chelmsford, and was 26 years of age. He was educated at Chelmsford Grammar School and Haileybury. Before going to Canada a year or two ago he held commission in the Essex Territorials. In Canada he was a real estate agent at Regina, Saskatchewan. At the outbreak of war he enlisted and came over with the first Canadian Contingent, and rose to the rank of sergeant. He obtained his commission in the Essex Regiment, and in September he left for the Dardanelles, where he was acting as bombing officer to the regiment. Last August he married Miss Helen Blain, daughter Mr. and Mrs. T. J. Blain, of Regina, the ceremony taking place at Chelmsford Cathedral. Two brothers are also serving; one Sub.-Lieut. H. Straight, R.N.R.. and the other Sec.- Lieut. R. M. Straight, 2nd Essex Regt. “Second Lieutenant Marshall Stuart Straight, 12th attached 1st, Essex Regiment, whose death is officially announced today was killed at the Dardanelles on December 24th. He was the eldest son of the late Arthur B Straight and Mrs Straight of Woodbury, Maltese Road, Chelmsford and was 25 years of age. He was educated at the King Edward VI Grammar School and Haileybury. In 1911 he went out to Canada and was in business as a real estate agent in Regina, Saskatchewen. Previously he had held a commission in the 5th Essex Territorials and at the our break of war he enlisted in the 95th Saskatchewen Rifles and subsequently came over to England as a member of the 11th Canadian Battalion with the expeditionary Force. He was promoted to the rank of sergeant and eventually gazetted to a commission in the 12th Essex. In the same edition of the Haileyburian, in the Haileybury Letter, L.S Milford (a senior beak) wrote 'M.S. Straight came down here one Sunday just before he went to France, and I had the good fortune to meet him on my way to lesson', fleeting meeting merely five months before the tragic death in action of a man in his mid twenties. Following Marshall’s death the following items of his were returned to his family: 1 silver match box holder, 1 compass, 1 wallet containing photos, 1 metal cigarette case, 1 flask, 1 purse containing 1 coin, 1packet medicine case, 2 ear drums. 2 collar studs, 1 cheque book. 1 currency note wallet, 1 cigarette tube, 1 charm chain, 1 bundle of letters, 1 pair of scissors in case, and 1 small letter brooch. Marshall was born in Springfield on 3rd October 1889, the eldest known child of the hop merchant Arthur Brookes Straight and Sarah Elizabeth Straight (nee Durrant). Both his parents had been born in Chelmsford; his father in 1848, his mother in 1855. They had married in at St. Mary’s Church, Chelmsford on 25th April 1883. At the time Marshall’s father was aged 35, a gentleman of Guy Harlings, Chelmsford, the son of William Straight, also a gentleman. Marshall’s mother was aged 28, of Chelmsford, the daughter of the wine merchant Andrew Durrant. Durrant was to be one of the first six Aldermen when Chelmsford Borough Council was formed five years later. Also married that day ,in what was a double ceremony, was Ellen Durrant, Sarah’s sister. Marshall was baptised at All Saints’ Church in Springfield on 3rd November 1889. At the time his father was a ‘gentleman’ of Springfield. Marshall’s five siblings were Katheen Straight (born 29th February 1888, died 1888), Arthur Hubert Straight (born on 8th October 1891, died in 1975), Marion Elizabeth Straight (born on 12th October 1893. died in 1982), Robert Malcolm Straight (born on 13th August 1895, died in 1973), and Brenda Margaret Straight (born on 10th July 1897, died in 1987). The elder three were Springfield-born, the youngest was born at Chelmsford. The 1891 census recorded one year-old Marshall living with his parents, an aunt and two servants in The Acacias, Springfield Road, Springfield. At the time his father was a commercial traveller. Around 1896 the family moved from Springfield Road to Woodbury in Maltese Road. The 1901 census found them there. Marshall was now 11 and accompanied by four siblings, his parents and four servants. His father was now a ‘hop merchant’s traveller’. Marshall and his brother Arthur were educated at King Edward VI’s Grammar School, Chelmsford from January 1901. Marshall left there in December 1903; his brother, the following December. Their brother Robert was also educated at the Grammar School, leaving in December 1907. 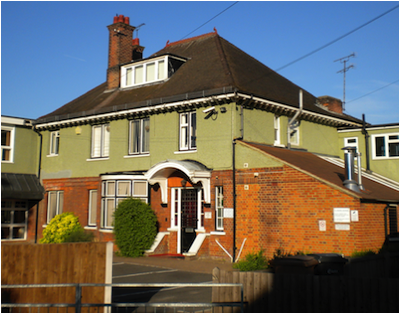 Marshall’s father died on 20th October 1902 and was buried at the Rectory Lane Cemetery in Chelmsford. He left an estate valued at £5,856 0s. 4d. Marshall studied at Haileybury School in Hertfordshire from 1904 to 1908. The school’s records show that he entered the care of Mr. A. A. Lea (Housemaster of Thomason) in the Easter term of 1904. 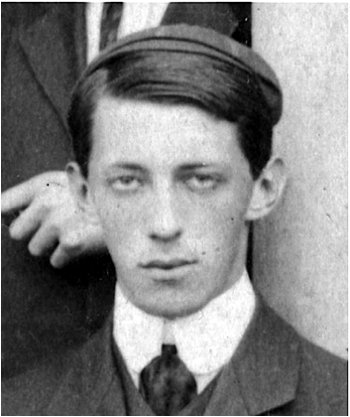 Marshall was educated on the Classical Side of the College and according to his reports he was a clever, charming pupil but with a strongly independent streak. Marshall once (1907.3) appealed to the Master over an impot (a written punishment) given to him by Mr. W. D. Fenning, the outcome is unknown. He was not a sportsman but in his final term he played for the House XI at cricket. In 1907 it was Marshall’s intention to become a solicitor or try for a place in the Consular service. In 1908 he went up to London and was interviewed for a legal position and appears to have been successful. Marshall is pictured in a school photograph from 1908. Marshall served for three and a half years in the Territorials with the 5th Battalion of the Essex Regiment, rising to become a second lieutenant, on 20th April 1909, the same day that Christopher Mellor Ridley also received his commission. . In 1911 the census recorded 21 year-old Marshall living with his widowed mother, two sisters and a servant, still at Woodbury (pictured). He was described as an ‘agent in Canada’ for a land company. In the period up to the start of the war Marshall made several trips to and from Canada. On 14th April 1911 he arrived in St. John, New Brunswick, Canada on board the S.S. Empress of Ireland having crossed the Atlantic from Liverpool. He was described as an accountant, intending to be employed as a land agent and was heading for Regina, Saskatchewan. On 9th August 1912 Marshall arrived back in Canada, this time in Quebec, having crossed the Atlantic from Liverpool on board the S.S. Victorian. He was heading for Regina, Saskatchewan. He made a similar crossing the following year, from Liverpool to Quebec, arriving on 23rd August 1913 on board the S.S. Laurentic, presumably having travelled the opposite direction in between those two crossings. The start of the war found Marshall still in Regina, Saskatchewan, Canada where he worked as an agent. He enlisted into the Canadian Over-Seas Expeditionary Force on 23rd September 1914 at Valcartier, some 25 kilometres north of Quebec City – a day after a fellow Chelmsfordian Bernard White had also done so there. Marshall‘s attestation papers show that his mother of Woodbury [Maltese Road], Chelmsford, was his next of kin. Marshall was unmarried, a member of the Active Militia and employed as an agent. He was described as aged 25, five feet eight and a half inches tall, with a 35 and a half-inch chest, dark complexion, brown eyes, dark brown hair, and was a member of the Church of England. Marshall was posted as a Sergeant 21885 in the 11th Battalion of the Canadian Infantry, part of the 4th Canadian Infantry Brigade. The battalion sailed from Quebec on 23rd September 1914 aboard the S.S. Tyrolia, arriving in Plymouth, Devon on 14th October 1914. The troops could not land at Plymouth and instead sailed to Avonmouth where they disembarked eight days later and began training at Bustard Camp on Salisbury Plain, Wiltshire. On 7th February 1914 the battalion moved to Avonmouth, Gloucestershire and sailed to St. Nazaire in France, arriving on 11th February 1915. By then Marshall is thought to have transferred to the Essex Regiment. Aged 25, Marshall married Helen Blain on 16th August 1915 at Chelmsford Cathedral. By that time he was described as a 2nd Lieutenant in the 12th (Reserve) Battalion of the Essex Regiment, based at Red Hall Camp in Colchester. His bride, aged 24, was the eldest daughter of Thomas Joseph Blain, and was recorded as living at Woodbury, Maltese Road, Chelmsford. “Military Wedding. - The marriage of Second-Lieut Marshall Stuart Straight, 12th Essex, eldest son of the late Mr. A. B. 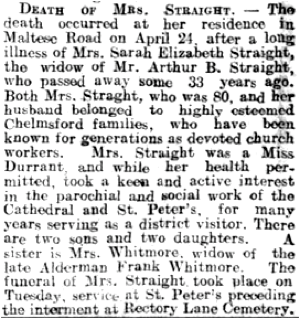 Straight, and of Mrs. Straight, of Woodbury, Chelmsford, and Miss Helen Blain, eldest daughter of Mr. and Mrs. T. J. Blain, of Regina, Saskatchewan, Canada, took place at Chelmsford Cathedral on Monday. Marshall is also commemorated on the Civic Centre Memorial, Chelmsford and by the Chelmsford Parish Great War Memorial in Chelmsford Cathedral. He was entitled to the 1914-15 Star, British War Medal, and Victory Medal. 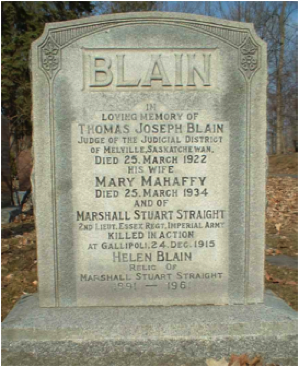 Marshall is also commemorated at Beechwood Cemetery in Carleton County, Ottowa, Ontario, Canada on the gravestone of his wife and in-laws. He left an estate valued at £1,204 4s. 10d. Marshall’s brother Robert Malcolm Straight who served as a private with the 28th Battalion of the London Regiment, as a 2nd Lieutenant in the 2nd Battalion of the Essex Regiment and as a Lieutenant in the Machine Gun Corps, was mentioned in dispatches and survived the war. In 1921 he visited Canada, enroute to Shanghai in China, whilst working for the Crittall Manufacturing Company Ltd. The 1918 register of electors recorded Marshall’s mother, Sarah Elizabeth Straight at 24 Maltese Road. She subsequently died there on 24th April 1936 and was buried at the Rectory Lane Cemetery in Chelmsford. She left an estate valued at £2,505 6s. 9d. After the war Marshall’s widow continued to live at Woodbury. She eventually died in 1961. Woodbury has now been demolished having been used latterly as St. Cedd’s School.